I created this tool to help me find where various text strings are in the client files for knowing what key to send to the client. It's also being proven to be very useful in finding what file a specific conversation is that may not be named so obvious (thanks SoE!). I'm sure a lot of modders out there wants to change a certain line an NPC says, or something else, to something silly but don't know what file it's in, so here you go! The tool works by having the user provide the directory to search through and then them entering in the value. The tool will just look for if that value resides in any of the values of the stf in whole or part, it doesn't have to be exact. What does have to be exact is the case, I'll make an update later to change this. 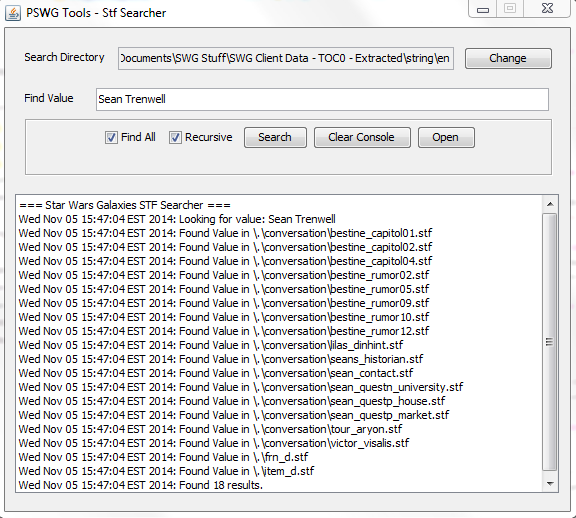 You can also open the first 5 results with your default stf editor if it's set. The tool is hosted on GitHub along with all of the source code for it. Good job Wave, good to see more people writing tools!